Trufa (a.k.a the Truffle) is a tiny (25 square meters or about 270 square feet), single room building that has all the cool characteristics of a stone cave. Though comprised of concrete, it resembles natural stone more than the refined surface we typically associate with cement. 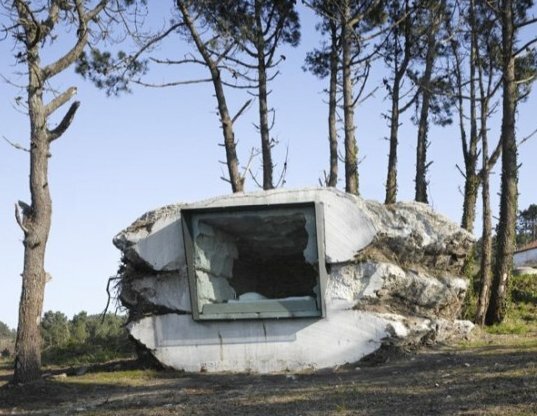 Located in Costa da Morte, Spain, the structure was designed by Antón García-Abril of Ensamble Estudio. What is most compelling about the building is the manner of its construction – which involves a cow (read on to find out more!). The Truffle is, in some respects, an example of 3D-printing at its most basic. The structure was created by the successive layering of concrete. Instead of a refined, machined effect, though, the concrete was shaped using only the most basic materials such as hay bales and earth for the formwork, resulting in a rustic character not unlike natural stone. Check out a short video showing the process here. Now for the most interesting part – after the concrete had set, quarry saws were used to slice the ends and reveal the compressed mass of hay inside. A cow then lived on site for the next year, and eventually ate away the hay to reveal the space within. What a weird and fascinating process! as KMart has suggested .. joke, right? quick guesstimate shows cross-sectional area of concreate to be about 15 sq.m, which makes the entire structure well over 100 cu.m. 100 cubic metres of concrete for a single 25 square metre room? Since when did 200 tonnes of concrete to make a 'tiny hut' become 'green'? 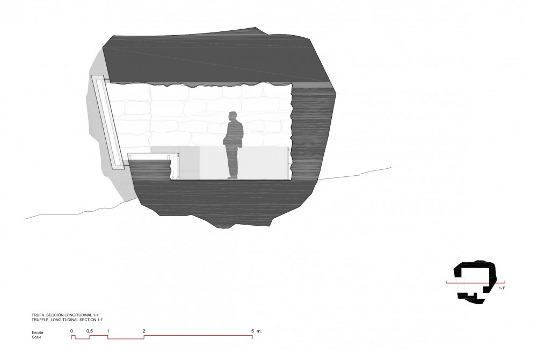 Trufa (a.k.a the Truffle) is a tiny (25 square meters or about 270 square feet), single room building that has all the cool characteristics of a stone cave. Though comprised of concrete, it resembles natural stone more than the refined surface we typically associate with cement. Located in Costa da Morte, Spain, the structure was designed by Antón García-Abril of Ensamble Estudio. What is most compelling about the building is the manner of its construction - which involves a cow (read on to find out more! ).